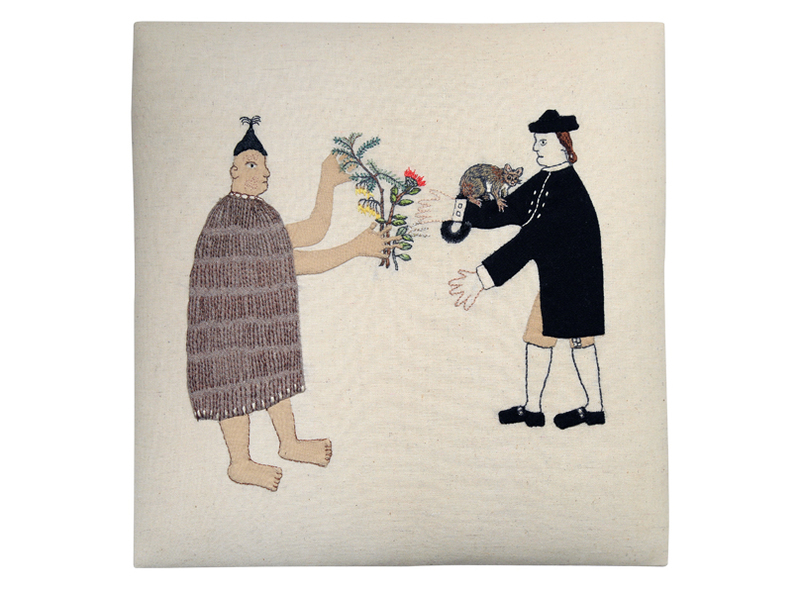 Sarah Munro’s series of embroidered works are based on a watercolour and pencil drawing, drawn in 1769, by Tupaia, master navigator from the island of Ra’iātea, who guided Lieutenant James Cook on the HM Bark Endeavour, across the Pacific Ocean to New Zealand. 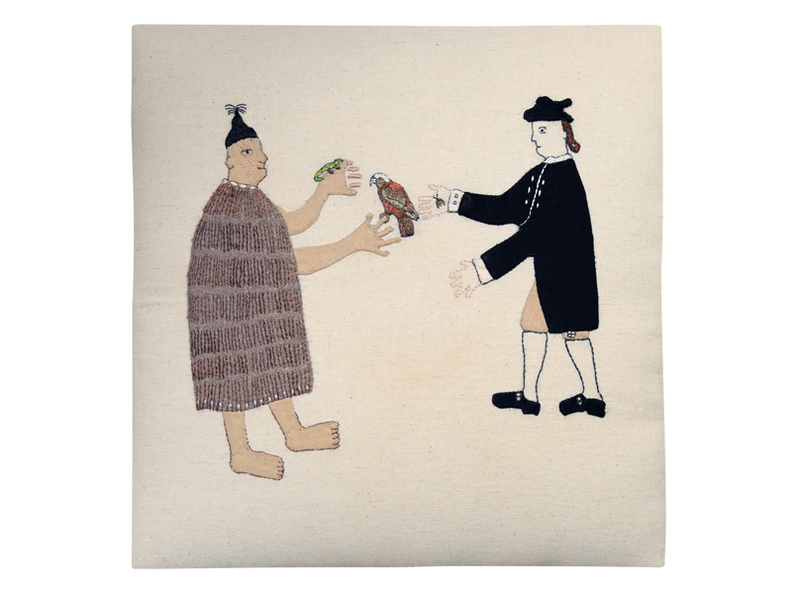 Tupaia’s drawing documents a instance of ‘first contact’; a trade that occurred in Tolaga Bay in the early weeks of Cook’s first survey of Aotearoa. 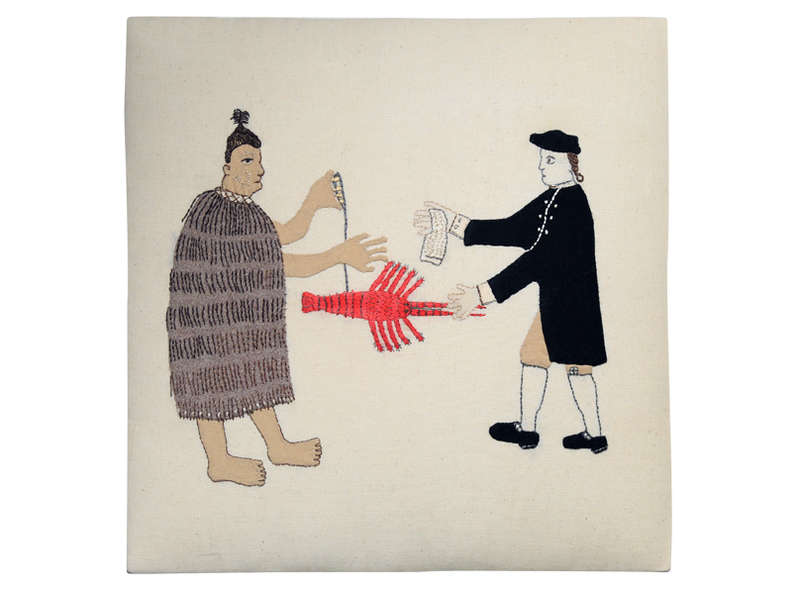 It depicts the trade of a large crayfish for a length if cloth / tapa. 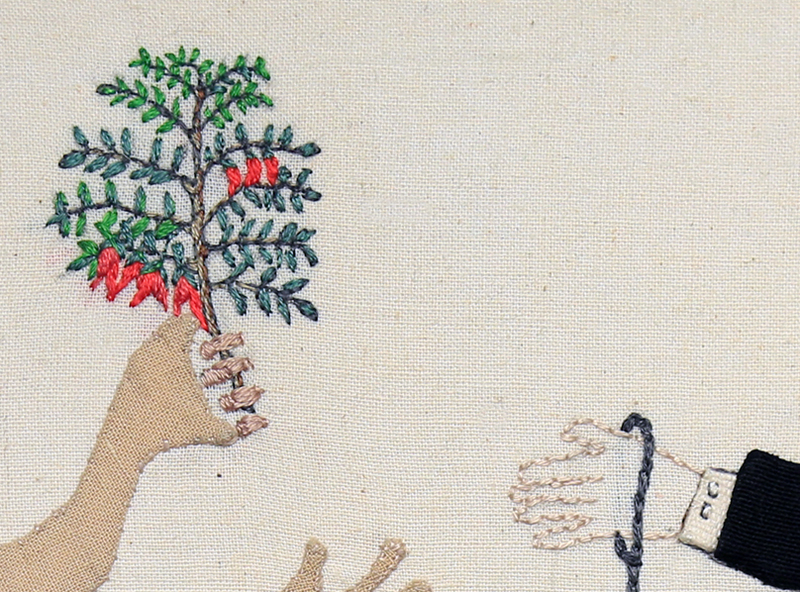 This drawing has been reproduced countless times over the years, artist unknown, until 1998 when a letter from Cook’s botanist Joseph Banks was found and the artist’s identity uncovered. 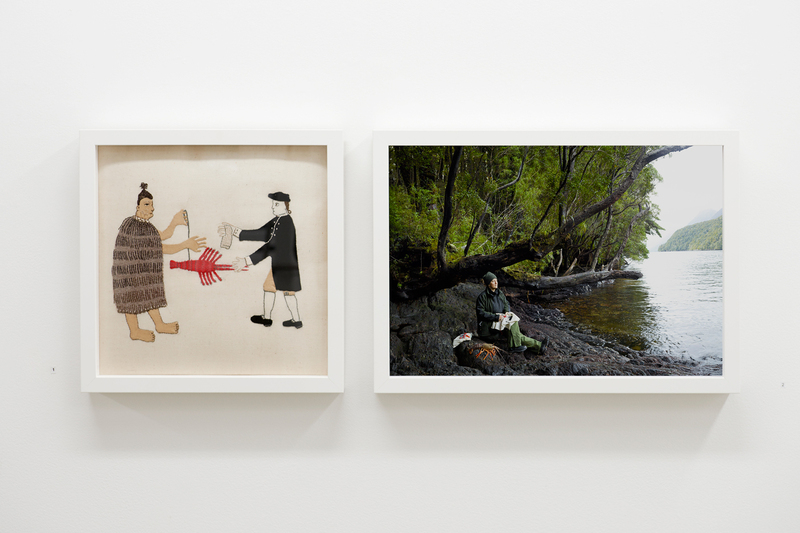 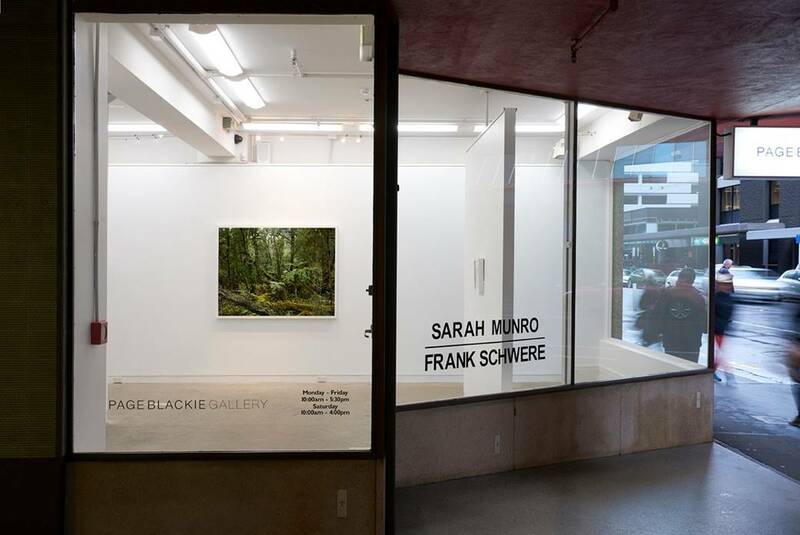 Both Frank Schwere’s photographic series and Sarah Munro’s series of embroidered works were begun during an artist research field trip in Dusky Sound in 2014. 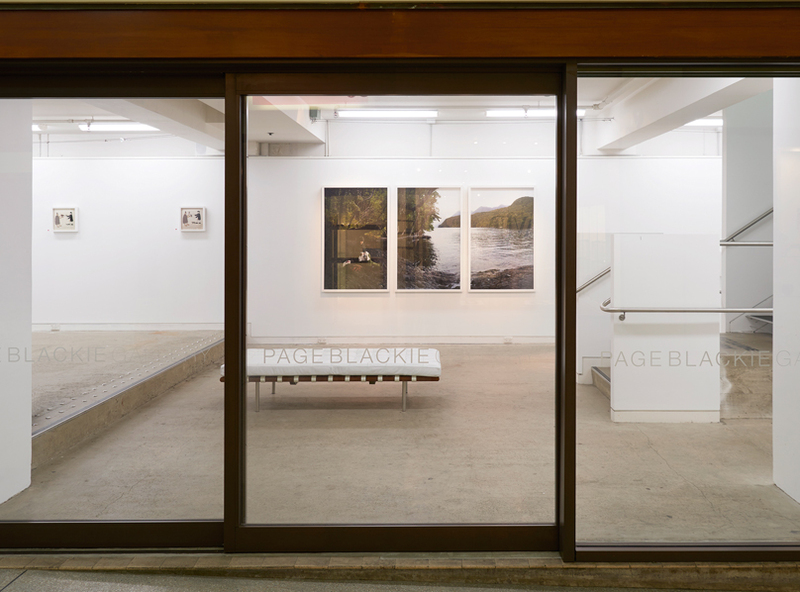 In the collaborative triptych ‘First Trade’ Sarah sits at work on the shore of Pickersgill Harbour, Dusky Sound, an anchorage used by Cook’s vessel, the Resolution, during his second voyage to New Zealand. 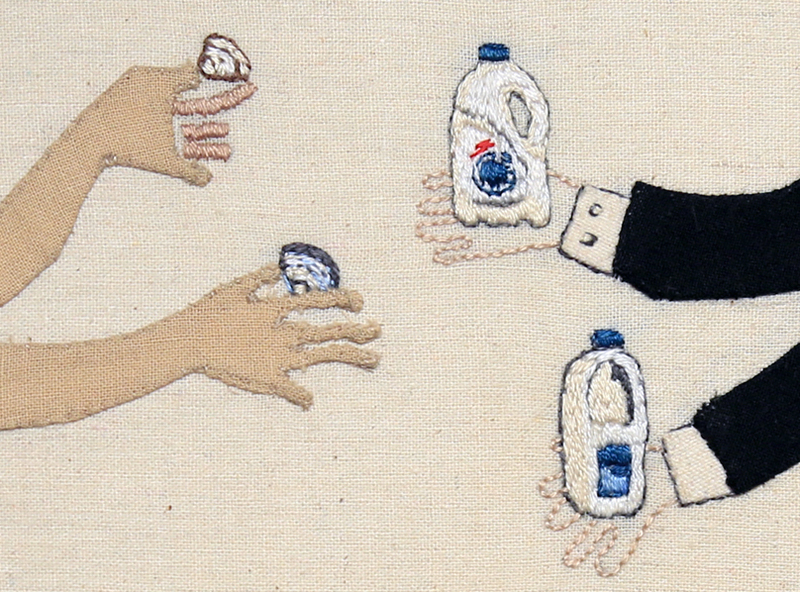 Munro’s series, euphemistically titled ‘Trade Items’, are not historically accurate illustrations but rather contemplations in cloth and thread of the ongoing repercussions of that first trade. 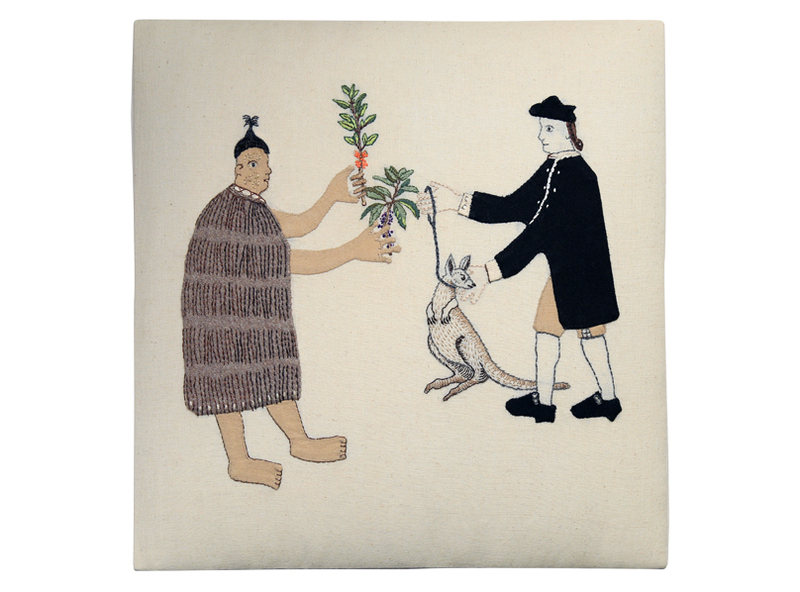 Detail: Trade Item – Wallaby Karamu, Mahoe. 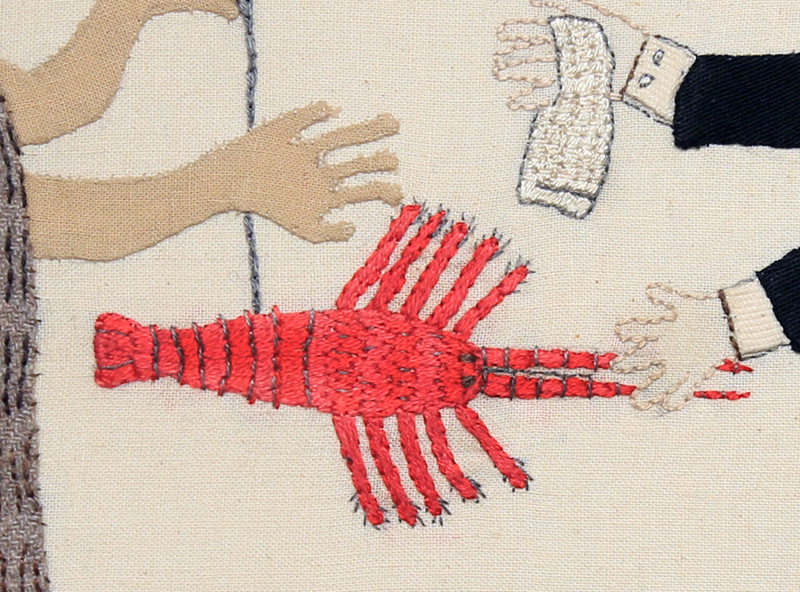 Detail: Trade Item – Crayfish, Cloth / Tapa. 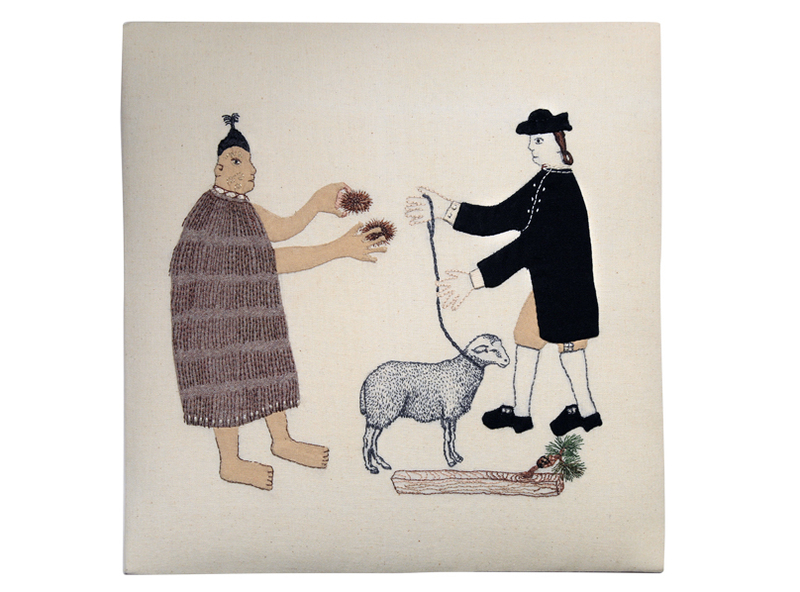 Trade Item – Farming, Forestry, Kina, Kaimoana Beds. 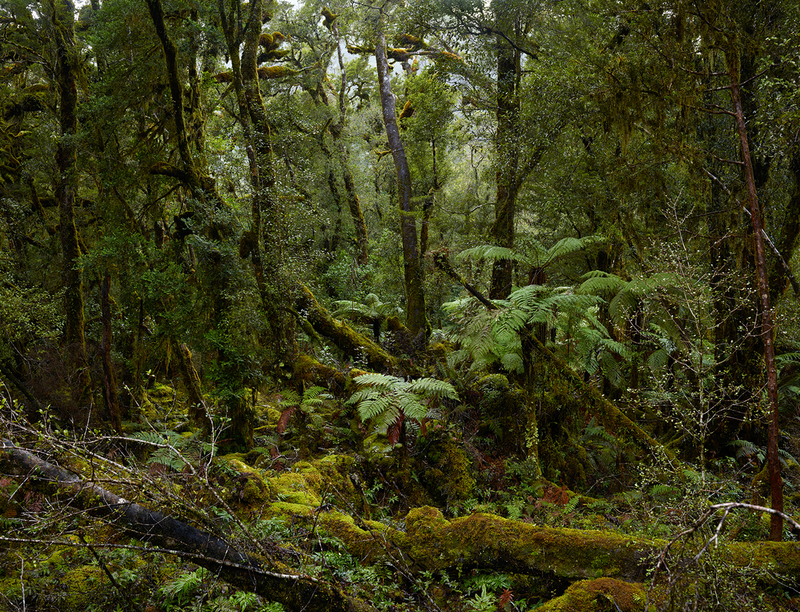 300x300mm. 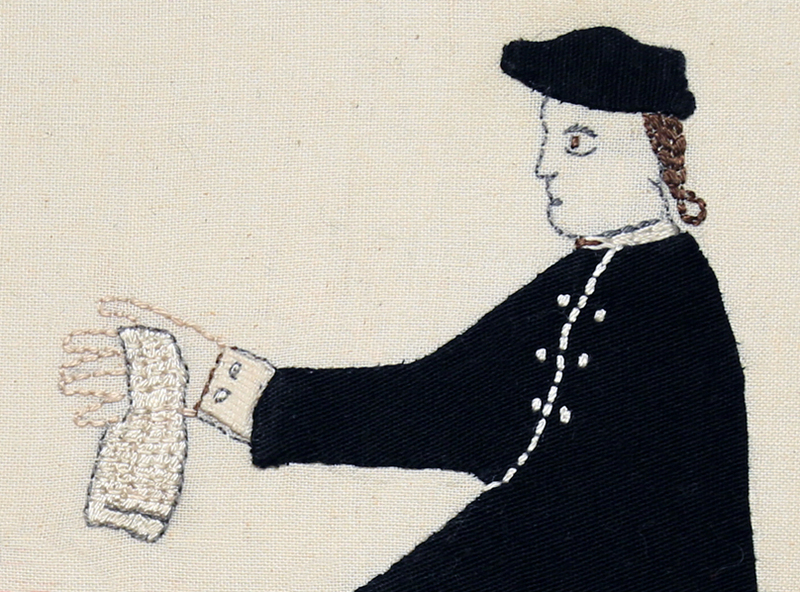 Cloth and thread. 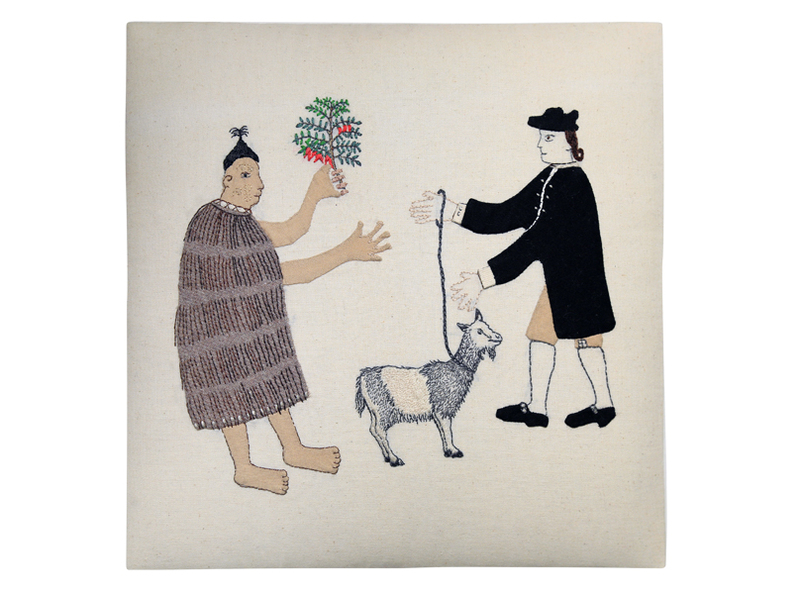 Trade Item – Goat, Kaka Beak. 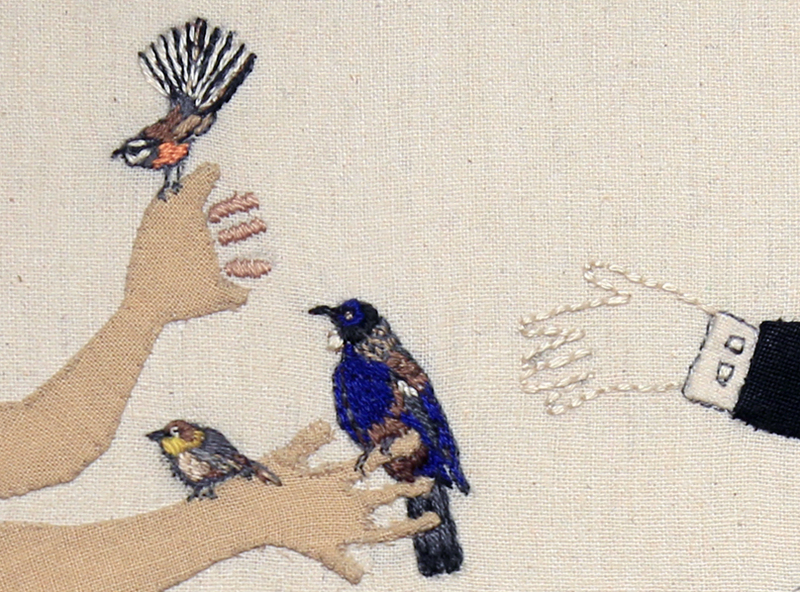 300x300mm. 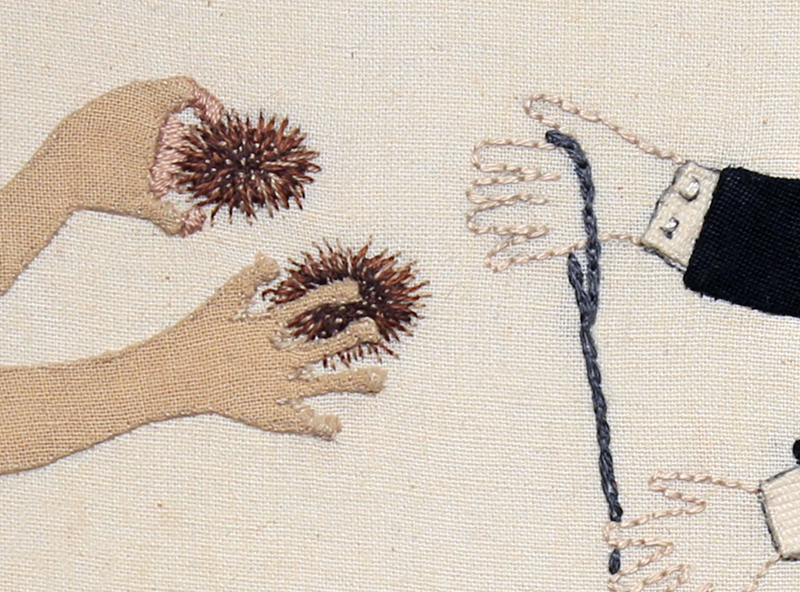 Cloth and thread. 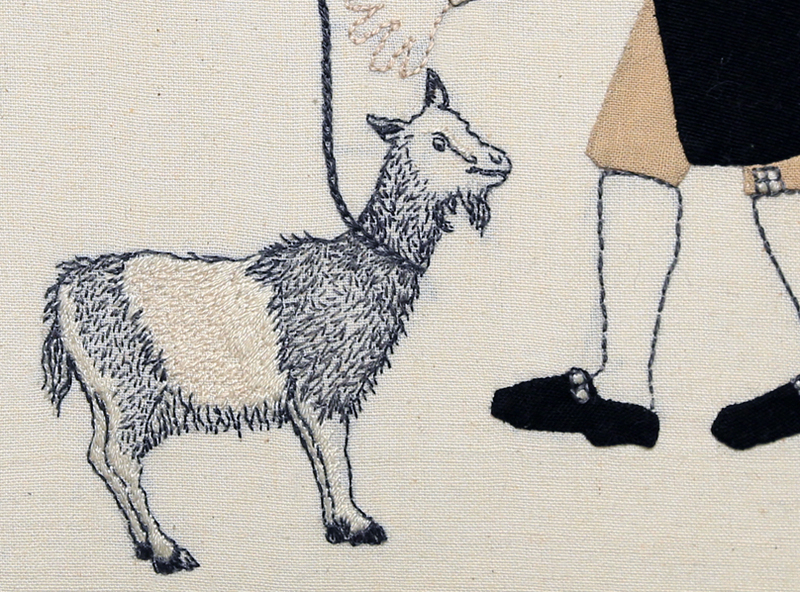 Detail: Trade Item – Goat, Kaka Beak. 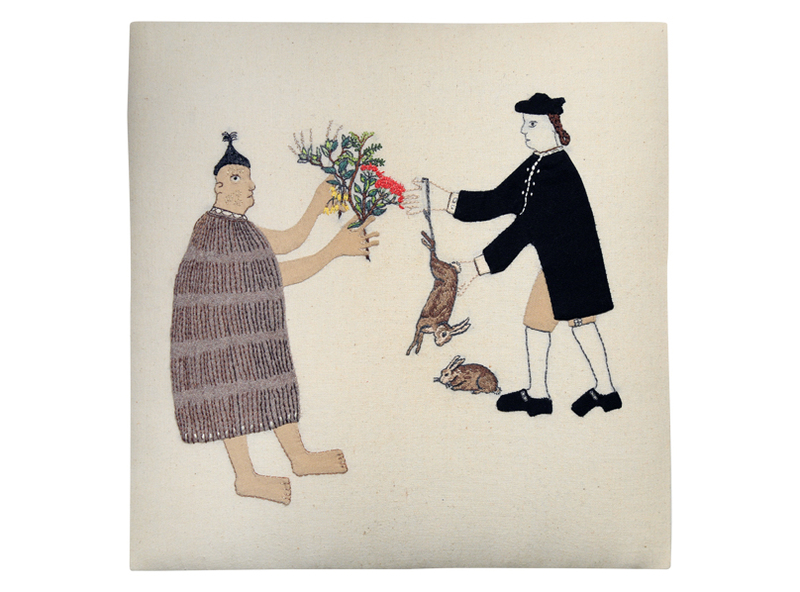 Trade Item – Rabbits, Regenerating Bush, Kowhai. 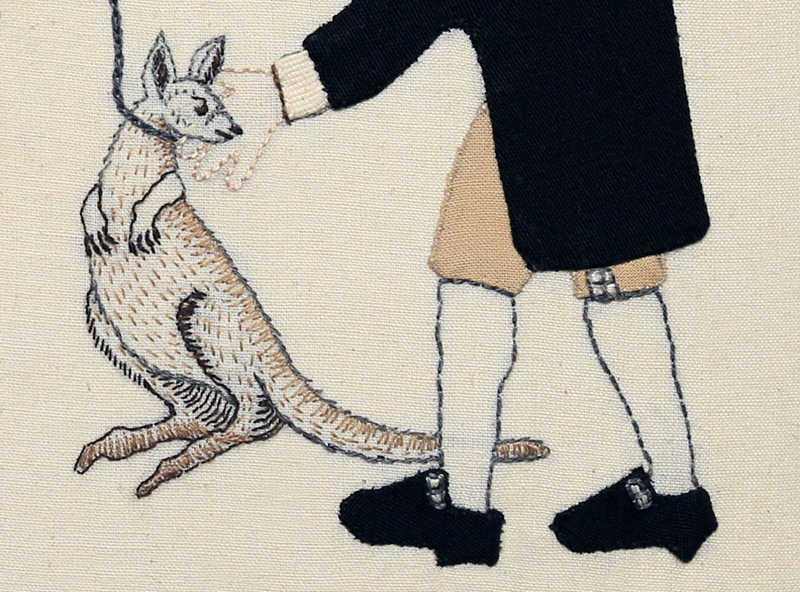 300x300mm. 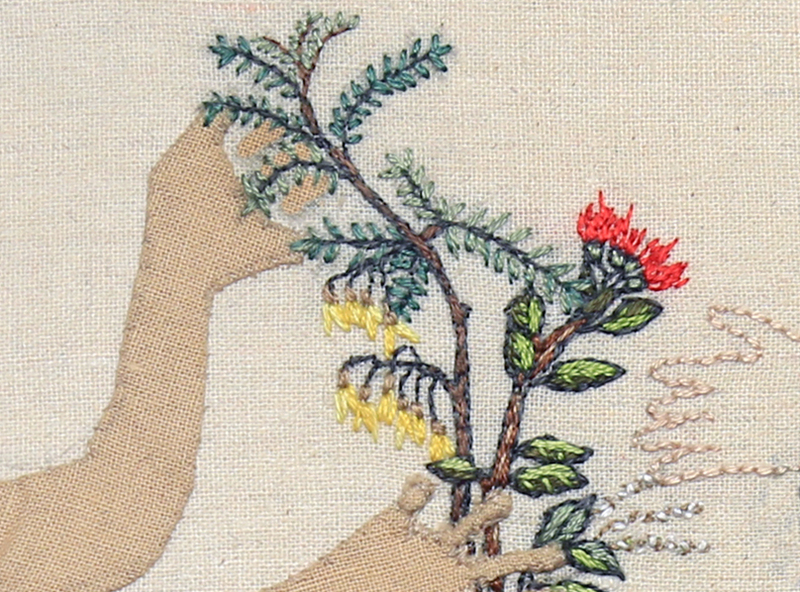 Cloth and thread. 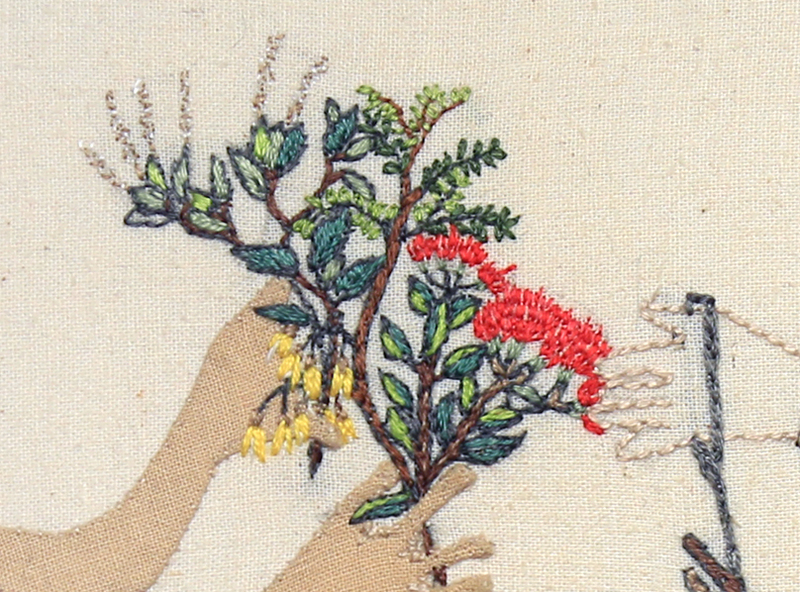 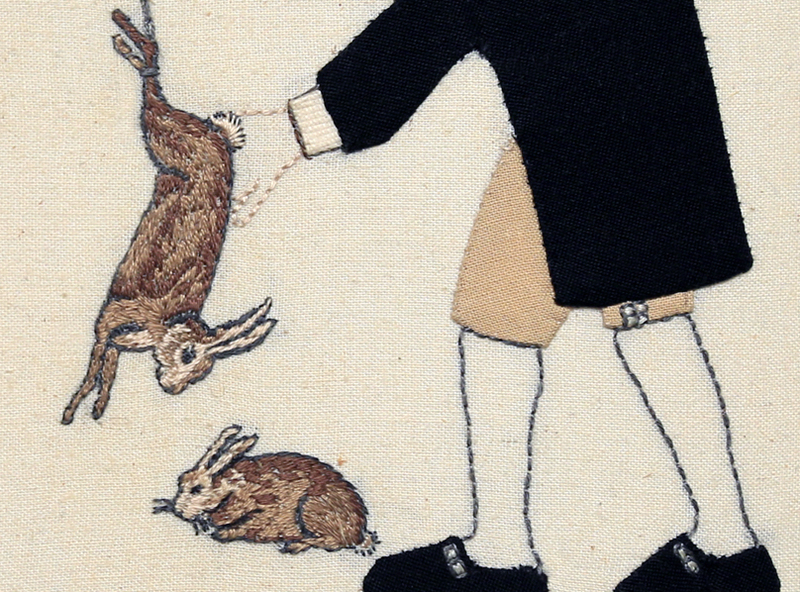 Detail: Trade Item – Rabbits, Regenerating Bush, Kowhai. 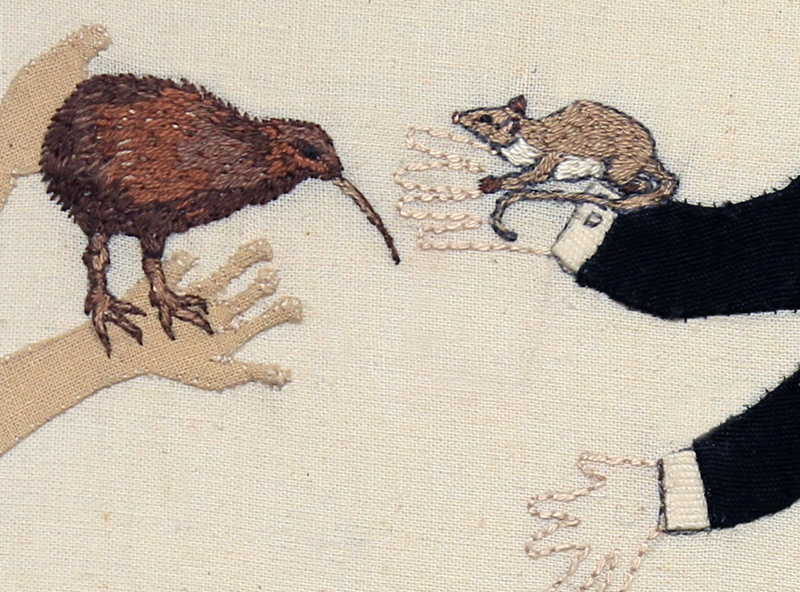 Trade Item – Stoat, Weasel and Kiwi. 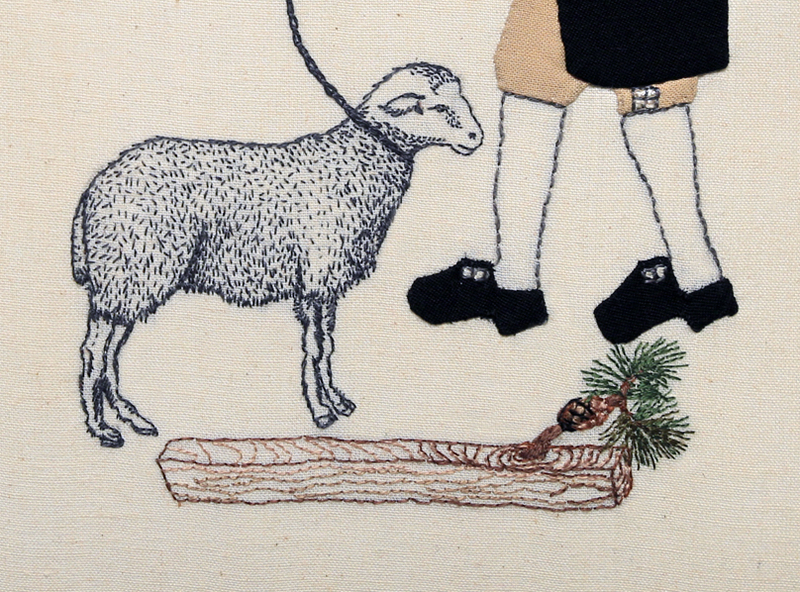 300x300mm. 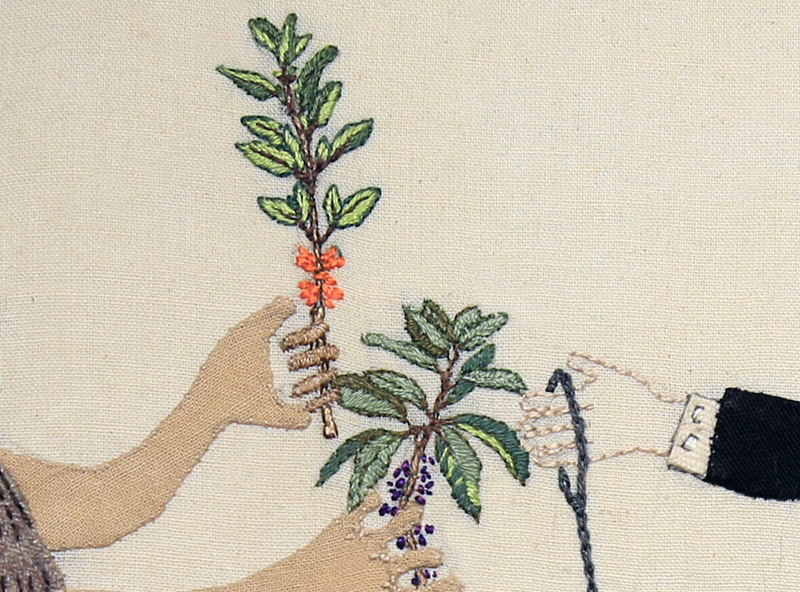 Cloth and thread. 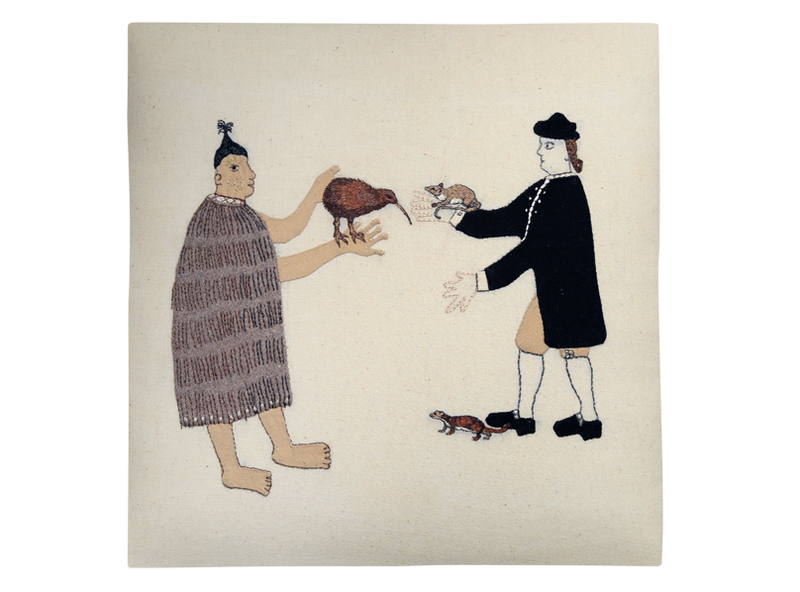 Trade Item – Wasp, Kaka, Jewelled Gecko. 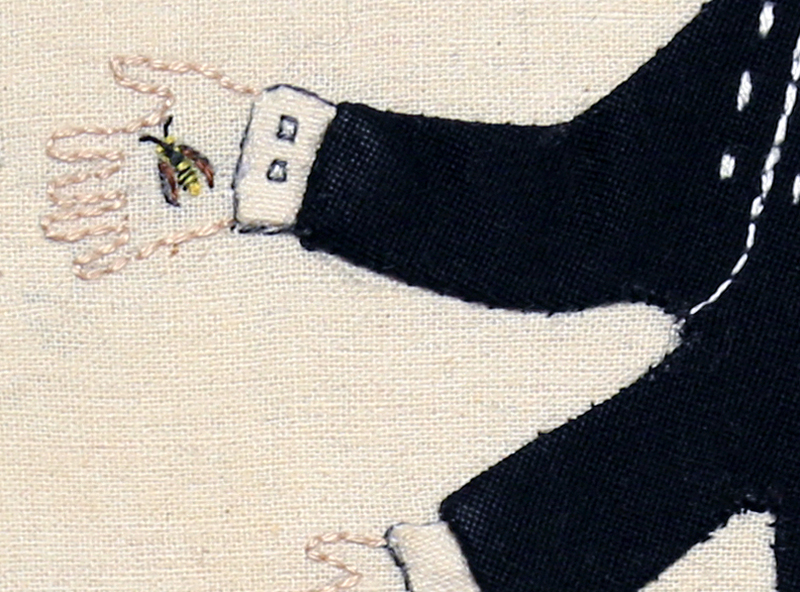 300x300mm Cloth and thread. 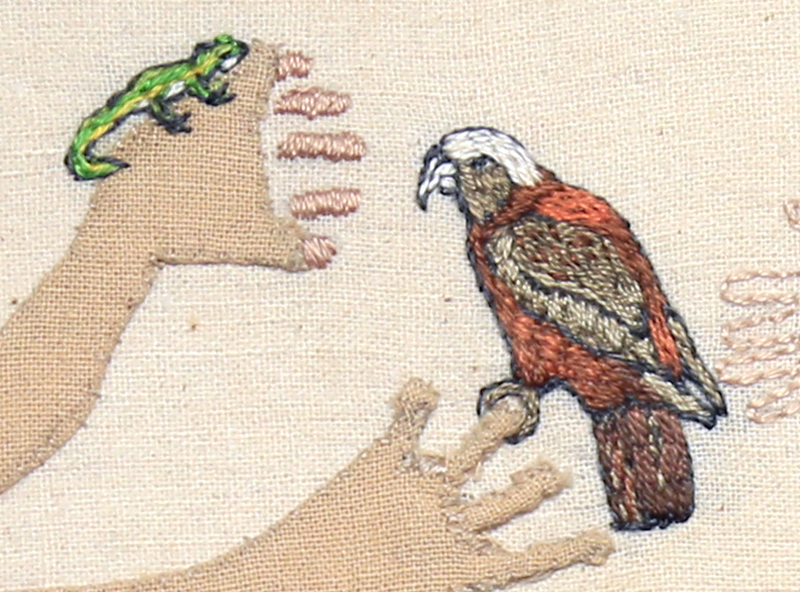 Detail: Trade Item – Wasp, Kaka, Jewelled Gecko. 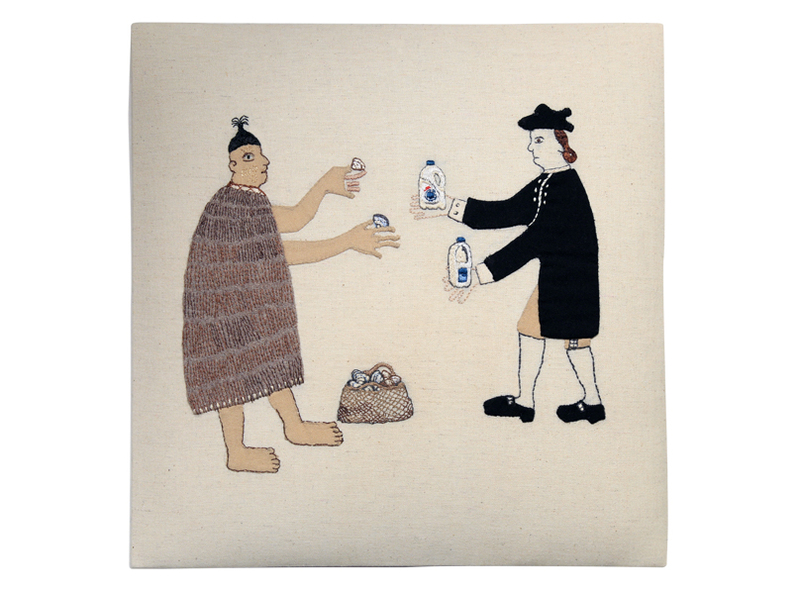 Trade Item – Dairy Industry, Toheroa, Tuatua, bivalve molluscs. 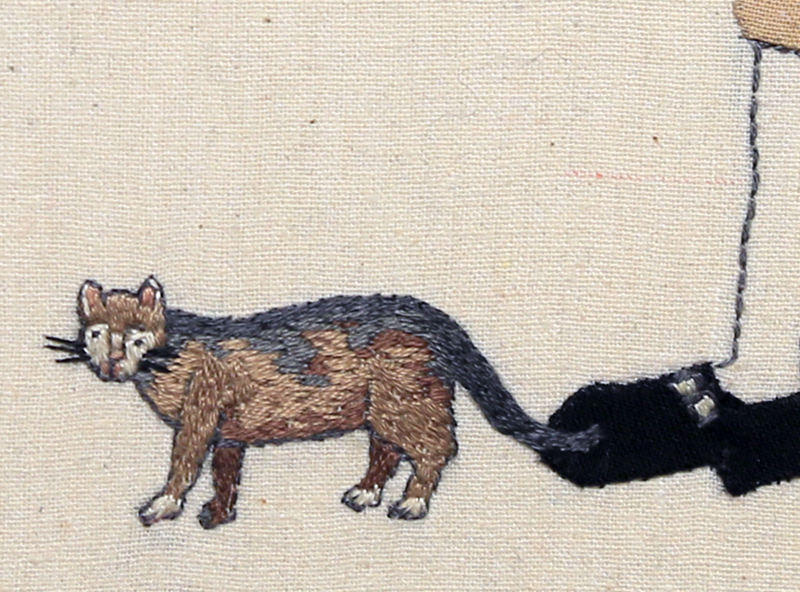 300x300mm. 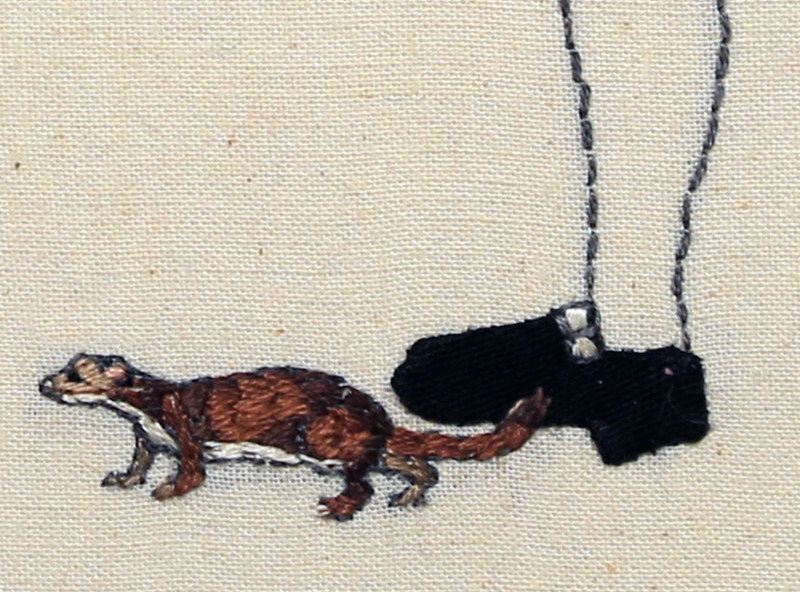 Cloth and thread. 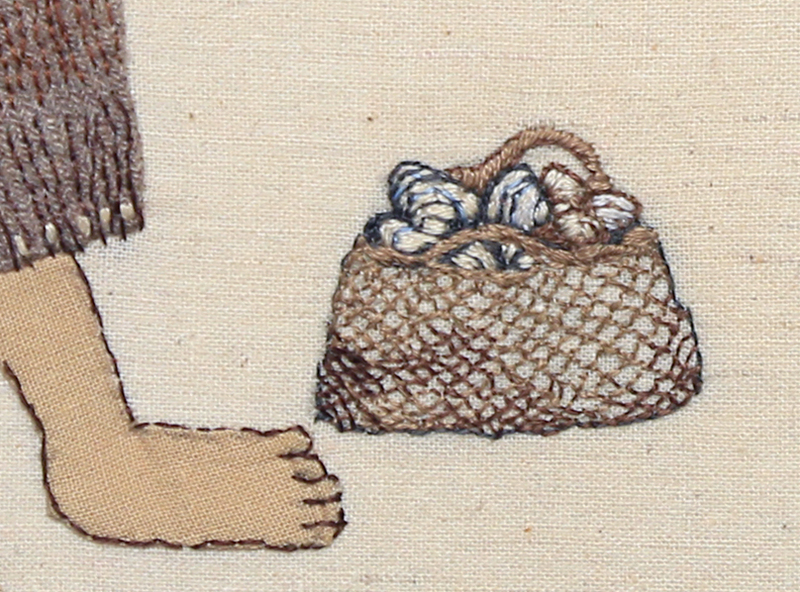 Detail: Trade Item – Dairy Industry, Toheroa, Tuatua, bivalve molluscs. Detail: Trade Item – Cat, Tui, Tauhou, Piwakawaka. 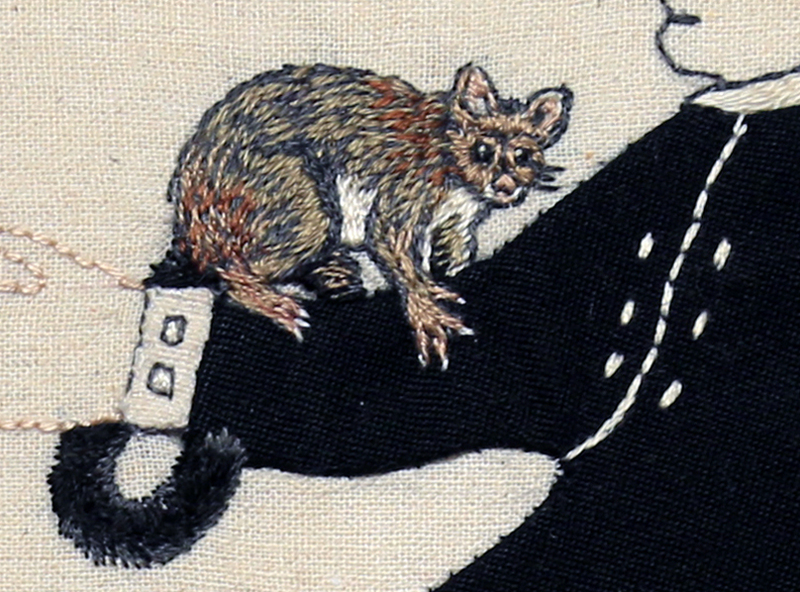 Detail: Trade Item – Opossum, Rata, Kamahi.